As a big project in the library this year we will be "Taking a Road Trip Across the USA" one region at a time. Every book has a setting. A place where the story happens. Many books have settings that are in various places in the USA. For each book you read that takes place in the USA fill out a quick Road Trip Challenge sheet and turn it in. Get your punch card punched and pick another book. Check out our monthly displays of books from different regions in the states. YA Novels have been selected by readers and Librarians across the states and they will be on display in the Library. Your job is to read at least one book from each region. If you have already read a book from that state... check it off! By no means are any of these lists complete - feel free to add to them. 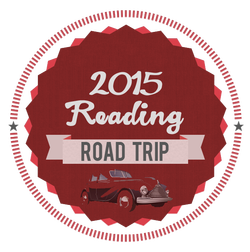 Pick up your road trip button and punch card from the circulation desk and start you reading road trip. Enjoy the ride! Below are links to book suggestions by region and state.